I had two favorite animal shows when I was a kid. 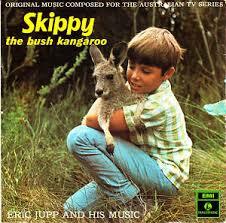 Skippy the Bush Kangaroo was set in Australia. The show’s star was Skippy, a wild female Eastern Grey Kangaroo. His sidekick was Sonny Hammond, younger son of the Head Ranger of Waratah National Park. The stories revolved around events in the park, including its animals, the dangers arising from natural hazards, and the actions of visitors. 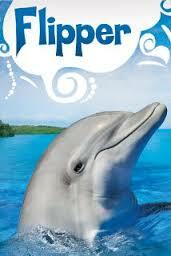 Flipper was a bottle nose dolphin. His sidekicks were Sandy and Bud, the two sons of Porter Ricks, Chief Warden at fictional Coral Key Park and Marine Preserve in southern Florida. Gosh they sound rather a like, don’t they. I got thinking about Skippy & Flipper because of Pamela S. Turner’s The Dolphins of Shark Bay. It’s about dolphins in Australia. Sort of Skippy meets Flipper. I am being a little funny, but this is a seriously good book. It is part of the “Scientists in the Field Series” from Houghton Mifflin. 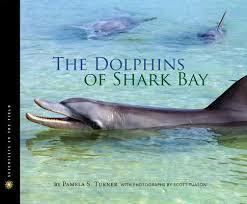 The book focuses on dolphins living in Shark Bay, Australia. These dolphins use sponges as tools to aid them in gathering fish to ear, and have been the focus of study by scientist Janet Mann and her research team. Scott Tuason’s colorful photographs enhance the text and draw readers into the book. Mann comes to know each of these bottlenose dolphins as individuals and as members of extended families, and she introduces readers to some of them. She has also worked with the Australian government to enact rules that better protect these dolphins from nearby commercial fishing interests and from over-enthusiastic eco-tourists. A good addition to a library and recommend for animal lovers.